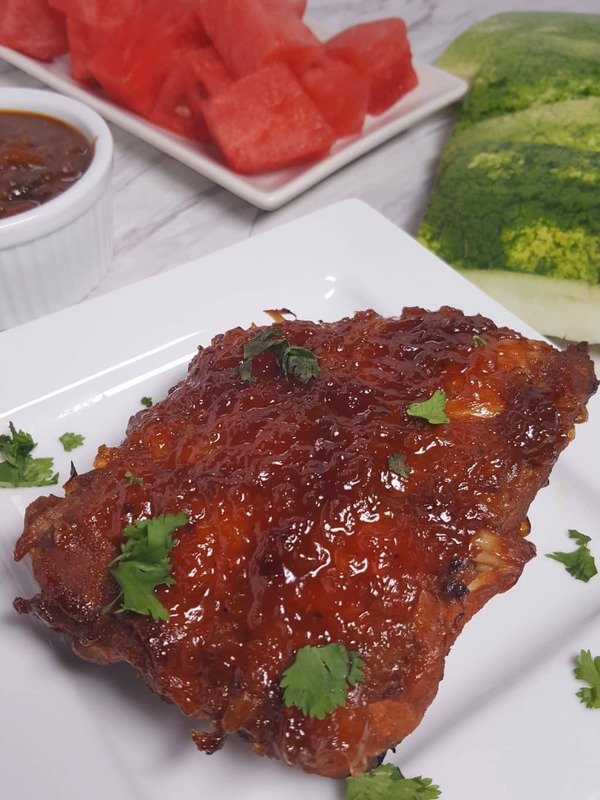 Pressure Cooker Watermelon Baby Back Ribs are tender and juicy Ribs with a Sticky Sweet and Spicy Barbecue Sauce, made from Watermelon Rind. 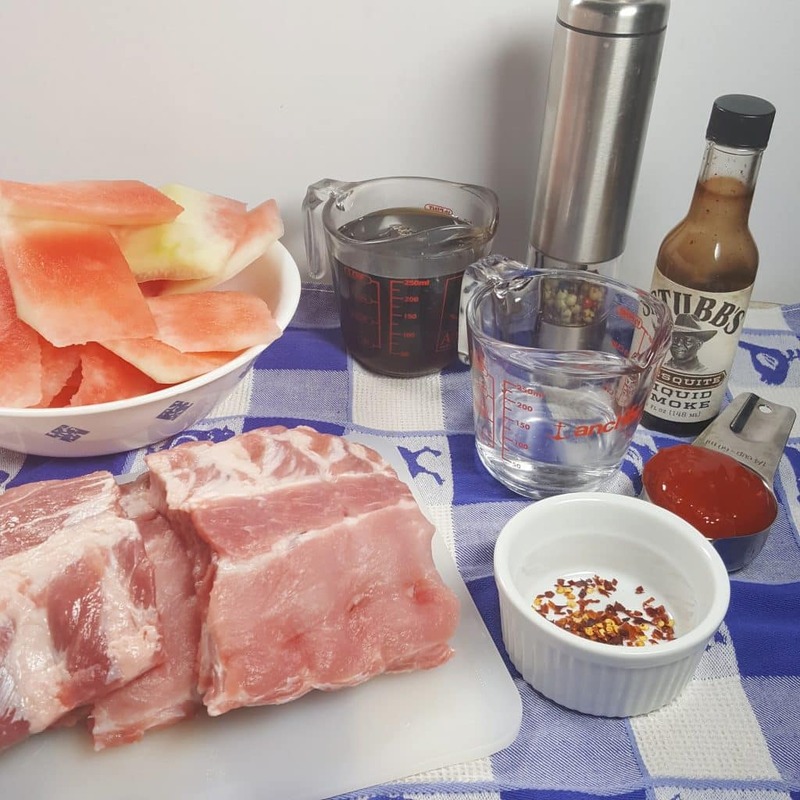 Inspired and made famous by the Hard Rock Café in the 80’s, this Pressure Cooker Watermelon Baby Back Ribs recipe is cooks in a fraction of the time. 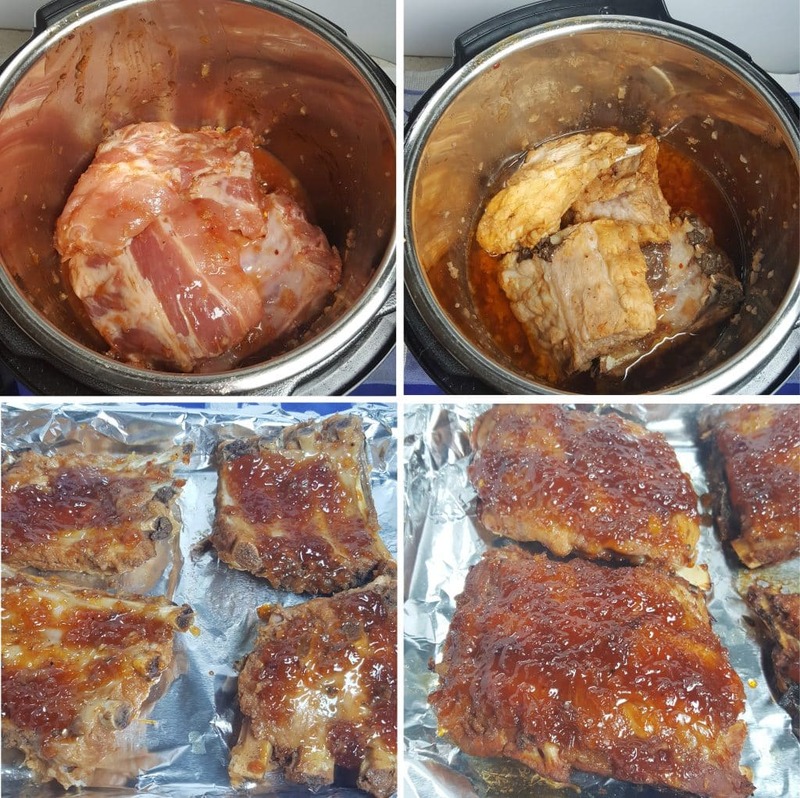 It’s a nice change from the usual Pressure Cooker Barbecue Baby Back Ribs recipe. 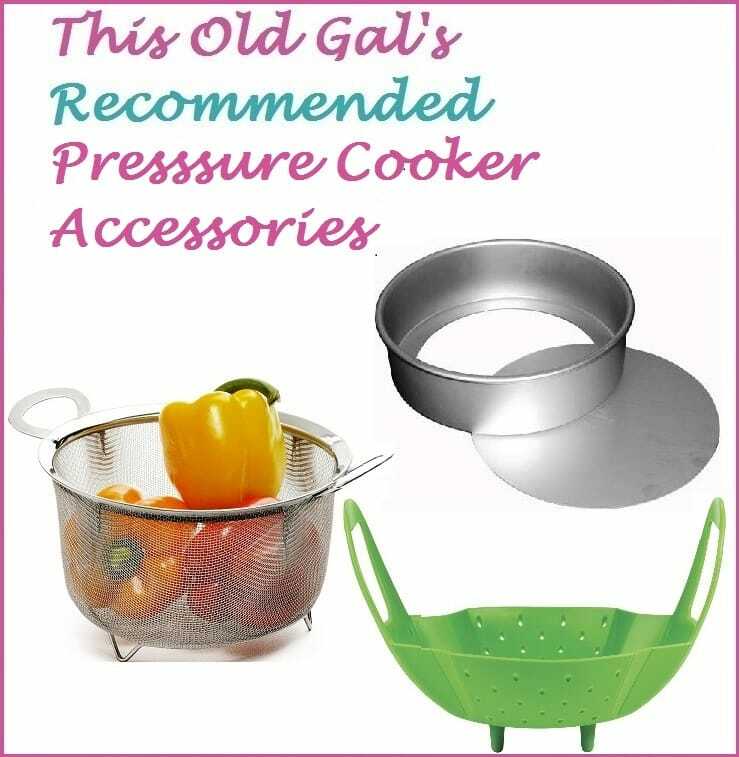 If you want to buy the same Pressure Cooker I use, click here. 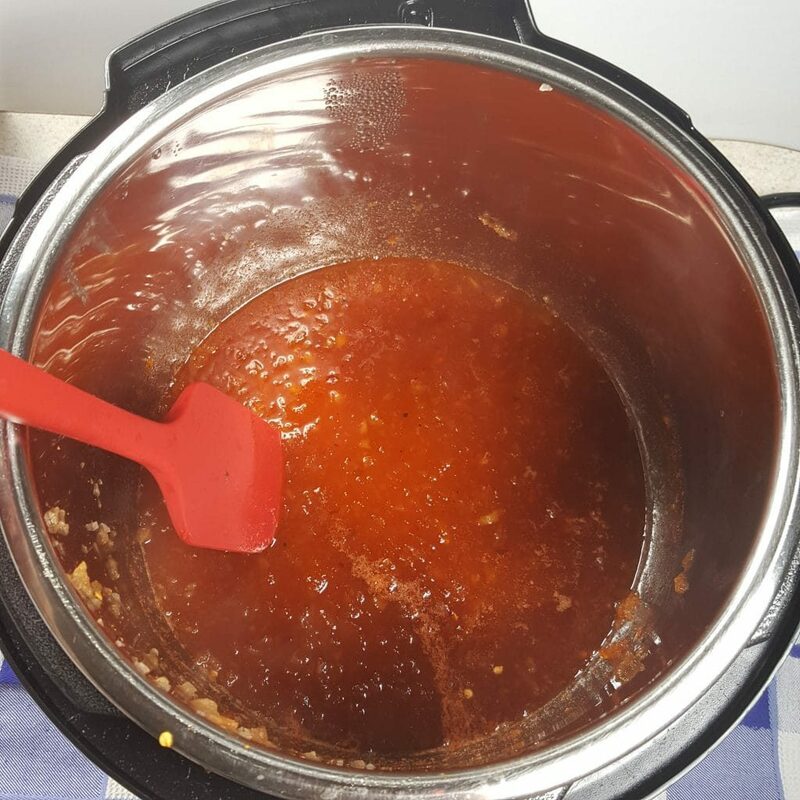 The Homemade Pressure Cooker Watermelon Rind Sauce is sticky sweet and slightly spicy. You will get a little kick in the back of your throat. Check out the recipe for more photos and comments. This recipe can easily made in advance and then finished off on the Barbecue Grill, in the Air Fryer or in the Oven under the Broiler. If you are making the Ribs for your family, cut them up into individual servings. For use at a picnic or party, cut the ribs into smaller servings. There is always a lot of food at parties and you want your guests to be able to taste all the goodies. Remove the green skin and the hard White Watermelon Rind. Make sure to use just the softer White and Light Red parts of the Rind. It is softer and sweeter. Get rid of the skin and hard White Rind. The nice red and juicy part of the Watermelon can be used as a side dish or dessert. Also, for a refreshing drink, try my Vitamix Watermelon Lemonade recipe. It makes a really great summer drink. It’s very refreshing and quenches your thirst and your body. A Food Processor or VitaMix is needed to make the Watermelon Rind Puree. You don’t want to pulverize the Rind into complete liquid. Just process it for a about ten seconds, until it becomes a puree. 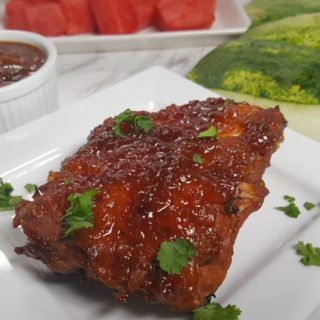 Use a Strainer to Drain the excess liquid from the Watermelon Puree, but don’t throw it out, as some of it will be used in the Pressure Cooker Watermelon Rind Barbecue Sauce. Check out that recipe for more details and chatter. Add the Watermelon Rind Pulp to the Pressure Cooker cooking pot. Measure out the rest of the ingredients and dump them into the Pot with the Watermelon Pulp. After pressure is released, cook down the Sauce for about 5 minutes. Make sure to stir the Sauce as it is cooking down. Remove about a cup of the Sauce and set it aside for later use. The Pressure Cooker Watermelon Rind Sauce will thicken as it cools. Add in 1/2 cup of Watermelon Rind Juice and mix it into the Sauce. Place the Baby Back Ribs into the cooking pot and push them into the Sauce. While the Baby Back Ribs are cooking, think about making some side dishes. My Pressure Cooker Classic Red Bliss Potato Salad is really delicious. Remove the Baby Back Ribs from the Pressure Cooker and place them, bone side up on a Baking Sheet. If there is any gunk on the ribs, remove it. 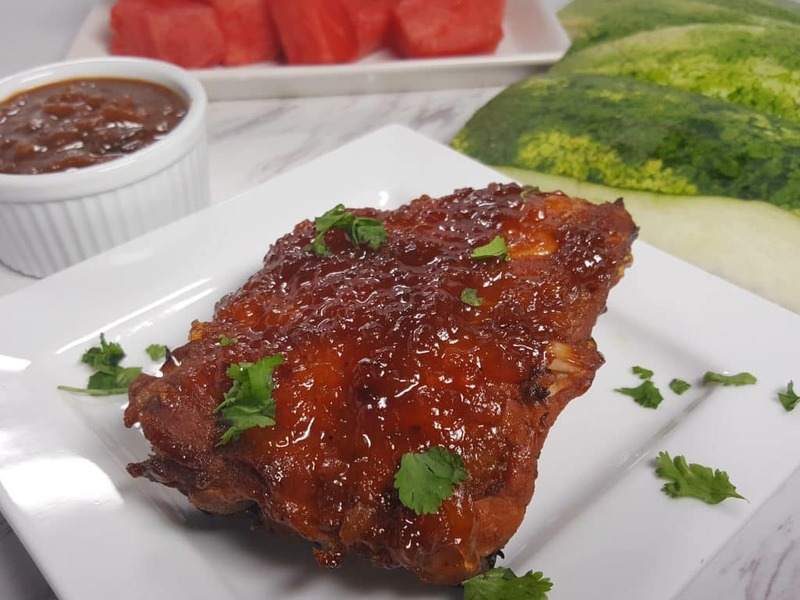 With a Basting Brush, generously Brush the Baby Back Ribs with the reserved Pressure Cooker Watermelon Rind Barbecue Sauce. Place the Ribs under the broiler until the Sauce begins to bubble. Flip over the Ribs and Brush on some more Sauce. When the Sauce bubbles, the ribs are done. You can also finish off the Ribs on the Barbecue Grill or in the Air Fryer. Serve the Pressure Cooker Watermelon Baby Back Ribs with some Pressure Cooker Summer Picnic Potato Salad, Pressure Cooker Holiday Baked Beans, Elote (Mexican Corn on the Cob) and/or my Pressure Cooker Pasta, Cheese and Peas Summer Salad. While the red, sweet part is delicious to eat as is, check out my Vitamix Watermelon Lemonade for a sweet and refreshing drink. It goes great with these Pressure Cooker Watermelon Baby Back Ribs! Remove green skin and the hard white part of Watermelon Rind. Cut up the white/lighter red part of the rind and place into a food processor. 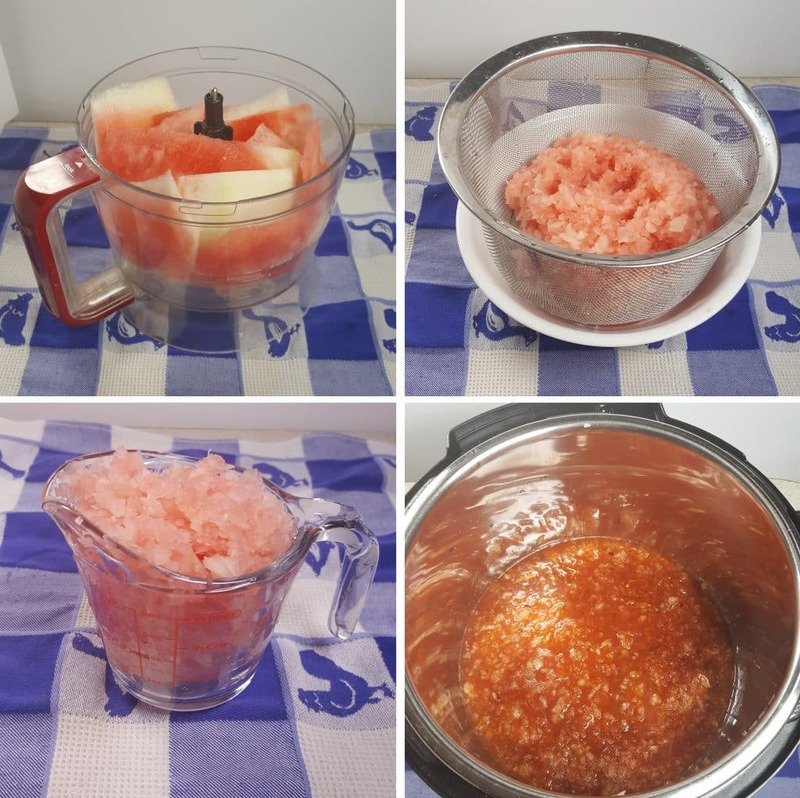 Process for a few seconds to make Watermelon Pulp. Strain most of the Juice from Watermelon Pulp and set aside. Add 1 full cup of Watermelon Pulp to Pressure Cooker cooking pot. Add the rest of the ingredients. Lock on Lid and Close Pressure Valve. Cook at High Pressure for 15 minutes. Allow all Pressure to release Naturally. Remove lid and simmer for 5 minutes. Remove a cup of Sauce from the cooking pot and set aside. Remove membrane from back of Ribs and cut into sections. Add 1/4 cup of Watermelon Rind Juice and mix into Sauce. Add Baby Back Ribs to cooking pot and push into the Sauce. Lock on Lid and Close Pressure Valve. Cook at High Pressure for 20 minutes. Allow Pressure to release naturally. Remove Ribs from Pressure Cooker cooking pot. Toss out liquid. Place ribs on Cookie Sheet, bone side up. Brush with Watermelon Rind Sauce. Place under Broiler for 2 minutes, or until bubbly. Turn over Ribs and brush on more Watermelon Rind Sauce. Return to Broiler for another 2 minutes, or until bubbly. PIN this Pressure Cooker Watermelon Baby Back Ribs! ANOTHER DISGUSTING MISUSE OF WATERMELON! WATERMELON IS NOT FOR COOKING! IT DOES NOT BELONG WITH CHILI OR ANY OTHER SPICE. IT DOESN’T BELONG WITH MEATS. i AM SICK AND TIRED OF CHEFS GOING TO THESE GODFORSAKEN THIRD WORLD HELL HOLES AND BRINGING BACK RECIPES FROM PEOPLE THAT DON’T KNOW HOW TO COOK! Haven’t tried the recipe but This Old Gal has plenty of other recipes that might work better for you. I have tried plenty of her recipes and she has good taste. Wow everyone thinks they are a chef and a critic. I have tried this and isee really good. So if you found this on a third world recipe page please tell us what country it is from. I have a recipe of the world page and like to post correct information. Thanks in advance Georgana. Well this should be interesting to try. It looks tasty. Never had cooked watermelon before.